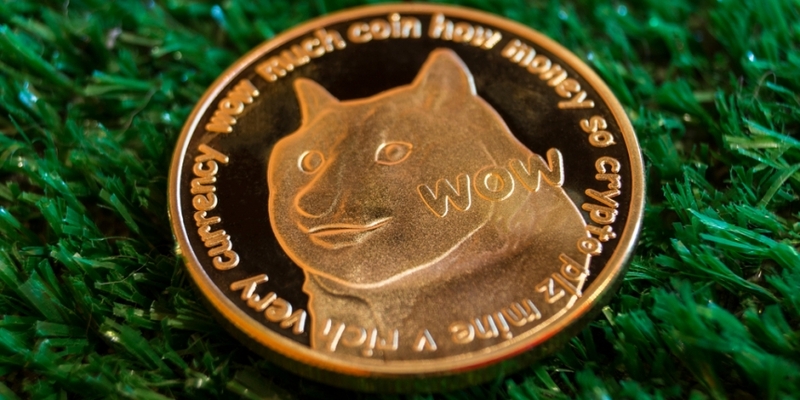 Market data shows that the meme-themed dogecoin was the worst-performing coin out of the world’s largest 25 cryptocurrencies by capitalization for the month of October. The cryptocurrency – derided as a joke by some, beloved by others – first hit the market in 2014 and has since been through a series of boom-and-bust cycles ever since in terms of overall market performance. The cryptocurrency’s most recent price boom began at the end of August and extended into early September, when its price surged over 160 percent to reach a six-month high of $0.0068 on September 10th, according to data from CoinMarketCap. 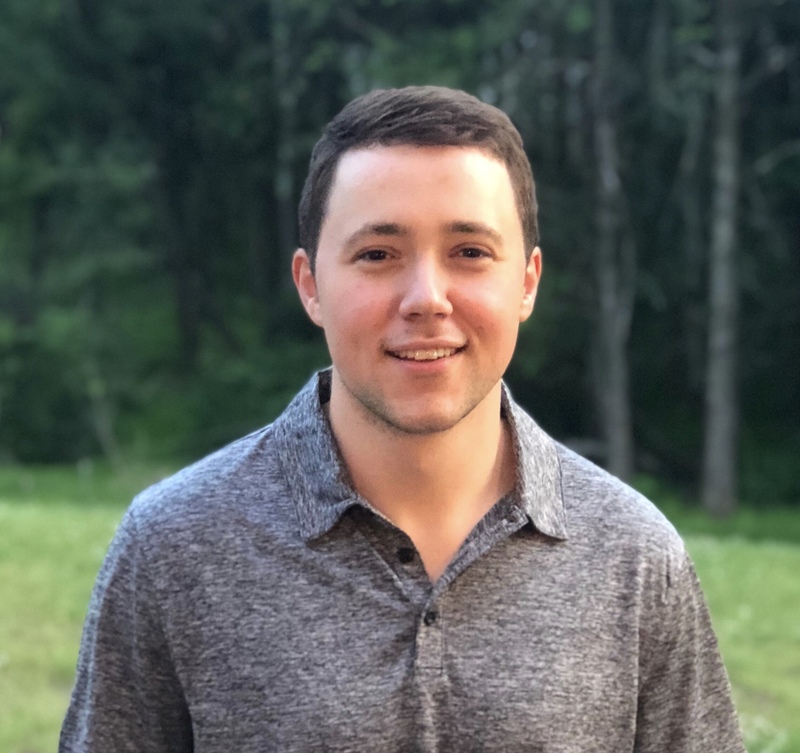 Those fortunes reversed in October, resulting in a 36 percent monthly loss that brought the coin’s price more than 50 percent below that September high-water mark. And as can be seen in the chart below, these cyclical price movements are nothing new to DOGE. According to data from Coinmetrics.io, DOGE often provides a 30-day return in excess of 100 percent as depicted by the thin orange line. DOGE’s price vs. BTC is comprised of the orange area in the background, which further shows the cyclical nature of its price action. In fact, 2015 was the only year to not include a 30-day return above 100 percent, although it did come close with a 94 percent return in a 30-day span. What’s more, the 30-day percent returns have exceeded 300 percent on multiple occasions since 2014. As can be seen, the booms are often followed by busts when the monthly returns hover just above or significantly below zero. This metric entered negative territory on October 10th and has yet to return to a positive value. 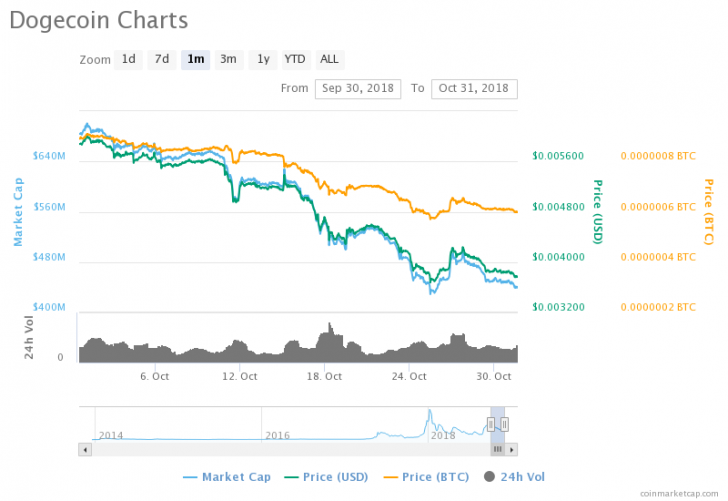 Indeed, it was a poor month for DOGE in terms of percent change, but with 22 of the top 25 world’s largest cryptocurrencies reporting losses over the course of October, DOGE’s performance wasn’t unique. DOGE was in a slow but steady decline since the month began at a price of $0.0058, until it concluded at a 36 percent lower price of $0.003764. From open to close, October was DOGE’s worst-performing month since last March, when it fell 52 percent. In terms of monthly trading volume, October’s $403 billion was just 30 percent of the prior month’s volume of $1.2 billion and its lowest since July, according to data from CoinMarketCap. 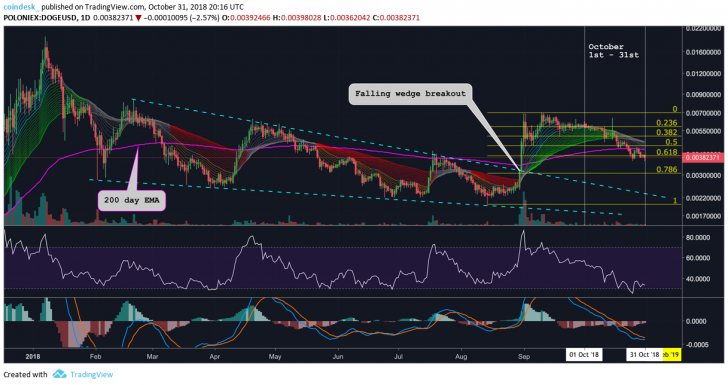 On August 31, DOGE’s price broke bullish out of a falling wedge (bullish reversal pattern) which set the stage for its latest “boom” cycle. 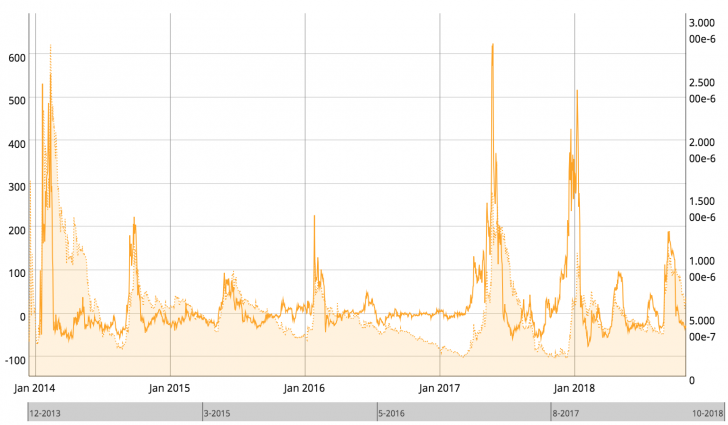 As with all of DOGE’s boom cycles, though, it eventually topped out on Sept. 10 at the price of $0.007, according to data from Poloniex, and the price began its descent thereafter. Using the Fibonacci retracement tool by connecting the low of $0.0023 on Aug. 14 to its $0.007 peak, it can be seen that price is hovering near the golden ratio of 0.618 retracement, which may offer support for a temporary up move. That said, the price has found acceptance below the 200-day EMA, so a sustained rally will not come easily. Coincidentally, the 0.618 Fibonacci is located at the same price level as the high of DOGE’s previous bull cycles, $0.0041. Resistance tends to flip to support once it’s broken, which bodes well for the immediate price action of DOGE. What’s more, the relative strength index (RSI) is approaching oversold territory, meaning sellers could lose strength in the near-term. The moving average convergence and divergence indicator (MACD) is echoing similar sentiments and the short-term bullish case would strengthen if the indicators produce a bullish crossover in the next few days. It should be noted that DOGE tends to retrace significantly after a strong incline, sometimes beyond 100 percent, so history would suggest that it’s unlikely that the price holds its current level for too long. If the daily Guppy Multiple Moving Average indicator (GMMA) flips red, it will likely confirm there is more downside action ahead for DOGE, in which case the next Fibonacci retracement of 0.786 near the price level $0.0030 could be looked to for support.